This small underglaze blue and white cobalt decorated dish is from the latter part of the Ming dynasty. Probably the Longqing (1567-72) to (Wanli 1573-1620) period. It is 4 inch (10 cm) in diameter. In many of the early books detailing the blue and white porcelain of the Ming, Wanli (1573-1619) period, the "Kraak" export porcelain is described as of a silvery blue tone. This is also the color of this small dish, but as of a pleasantly darker shade being a typical export piece. The decoration is very freely drawn and shows a man intently walking in a landscape. It is of course impossibly to know for sure who this man is, but in the Chinese literature there is a famous story from the troubled times by the end of the Song dynasty, which must have felt very similar to the time by the end of the Ming dynasty, This story is called "The Water Margin", or "Outlaws of the Marsh". In this story many people bands up together by as many different reasons as there are persons. Somehow this scene could be of one of these unfortunate men hurriedly travelling across the vast land of China seeking refuge among the "Outlaws of the Marsh". The unglazed foot rim is roughly cut and kiln grit has stuck in the glaze around the foot. 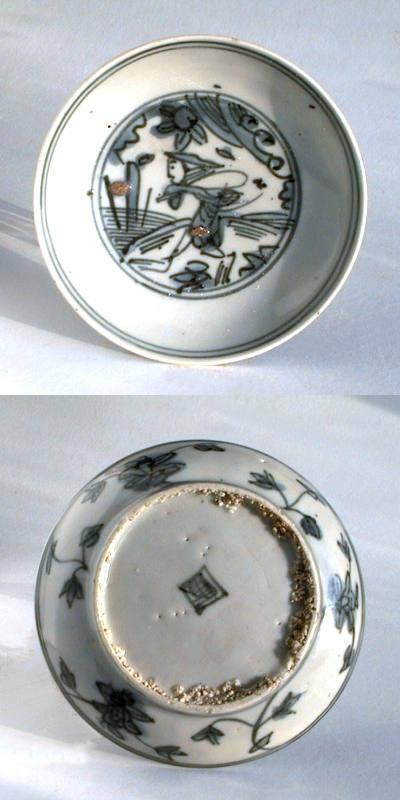 A few small burst glaze bubbles at the outer top rim is typical for pieces of this period. The glaze is glossy and soft to the touch and on a thin porcelain body.